With his work on Green Lantern: First Flight Kral has done just that. Creating themes for Hal Jordan (the alter-ego of the titular hero), Sinestro (the film’s villain), and the film in general (simpler sci-fi synth sounds that provide background music throughout the score). Kral explains the soundtrack’s sci-fi tinting in the following way: “The large majority of this film takes place in space buton several planets with many different species of alien races.” This alien sensibility comes out most impressively in the three and a half minute track “Labella’s Club” in which Kral mixes what might be described as sci-fi dance music with intentional electronic distortion to highlight the cruelty of the villain Sinestro. Some tracks, such as the suspenseful “Bugs in the Baggage” have more of a standard action film vibe, though Kral still manages to build tracks such as this into an action hero-sized crescendo, as horns battle back and forth with percussions to give our hero a sense of the danger he’s in. There’s no denying that this is an excitingly action-packed soundtrack (a few minutes of the track “Brutal Attack / Fate of Kanjar” will definitively prove that point – amid thrilling crescendoes and slowly sneaking strings), and with 20 tracks providing over an hour of music, La-La-Land Records and Warner Brothers Animation didn’t skimp on the musical front. Fans of the film will be glad to pick up this new soundtrack on cd (printed in a limited edition run of only 1500 units) or digitally in order to further enjoy the introductory adventures of their favorite superhero. 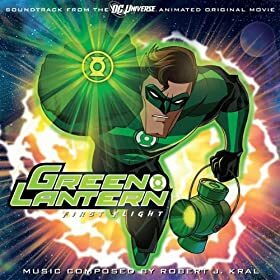 No user commented in " Music Review: Green Lantern: First Flight Original Motion Picture Soundtrack by Robert J. Kral "